Greenville, S.C. (December 19, 2017): The Center for Developmental Services (CDS) has completed their lobby renovation project, the first major renovation since their doors opened over seventeen years ago. 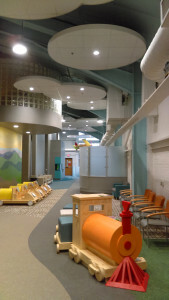 New features include a fun transportation theme with large wooden cars, a mural of the Blue Ridge Mountains, a separate waiting area for medically-fragile children, and a low-sensory waiting area for those patients who need less stimulation. The project designs were created by DP3 Architects, Ltd, and construction was supervised by Creative Builders, Inc. The new lobby will impact more than 6,800 Upstate children each year who come to the center for evaluation, diagnosis, therapy, and family support.